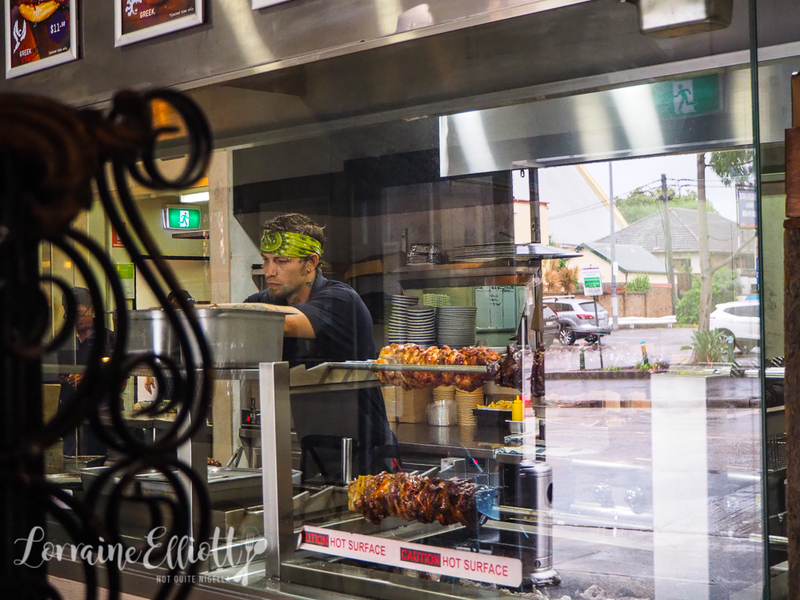 Stix and Pita is a Greek restaurant in Enmore serving up gyros, pita, dips and a range of charcoal meats. There's no dry, carved meat here. 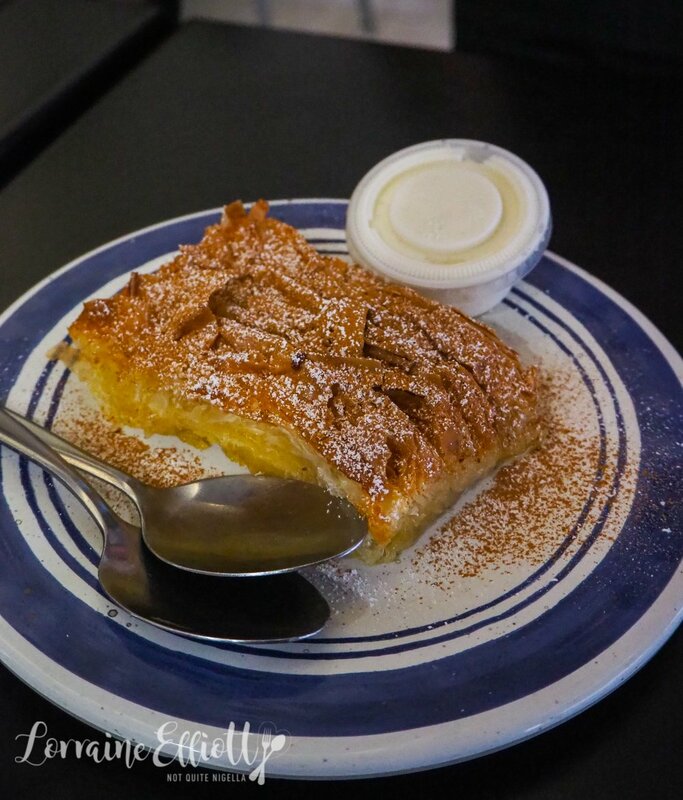 Instead the meats are succulent and juicy and whatever you do, save room for the heavenly light bougatsa! It was a rainy day where I had to cajole Mr NQN to leave the house. Luring him with the idea of a Greek feast wasn't enough-truthfully he doesn't love meat and our last Greek feast left a bit to be desired. 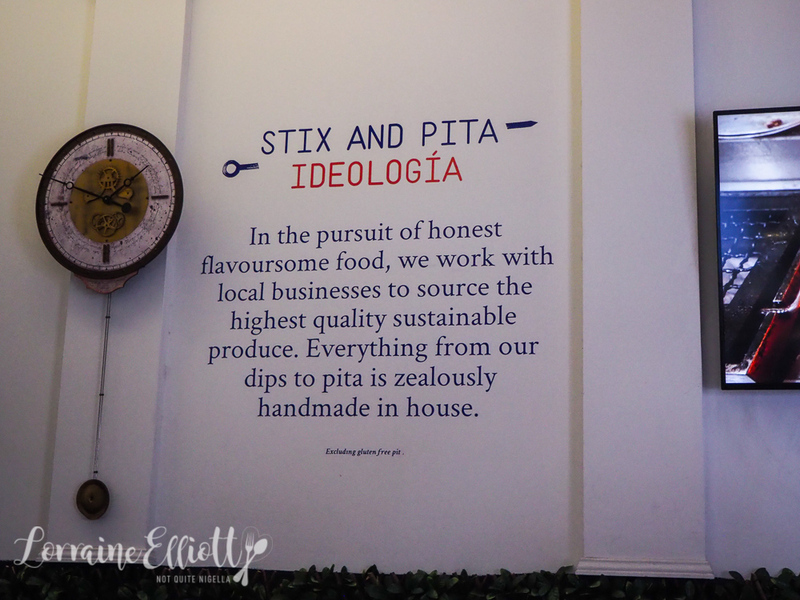 Stix and Pita came to me as a recommendation from a Dear Reader Aleksandra. On the list it went and on this gloomy Sunday we made our way to Enmore. 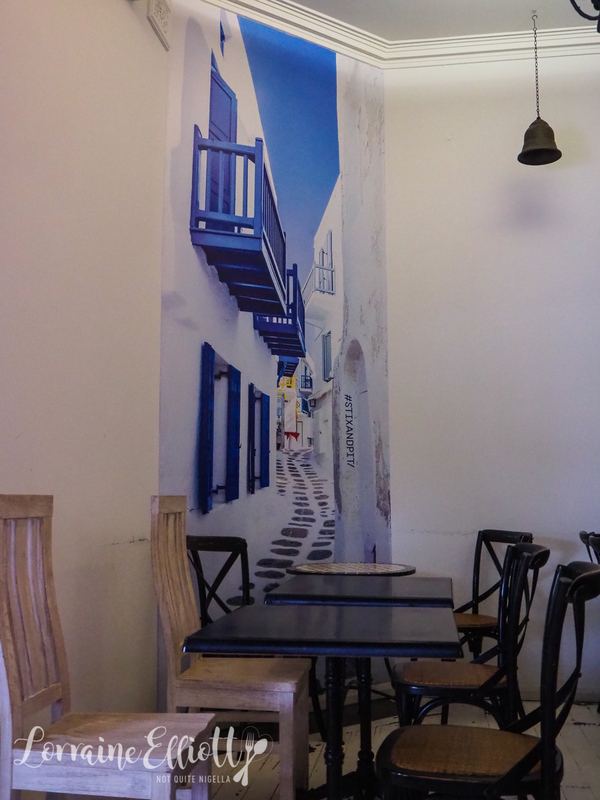 There are indoor and outdoor seats and since it is windy and raining we take a seat inside near the Greek Island mural. A sign says that everything is made in house except for the gluten free pita bread. 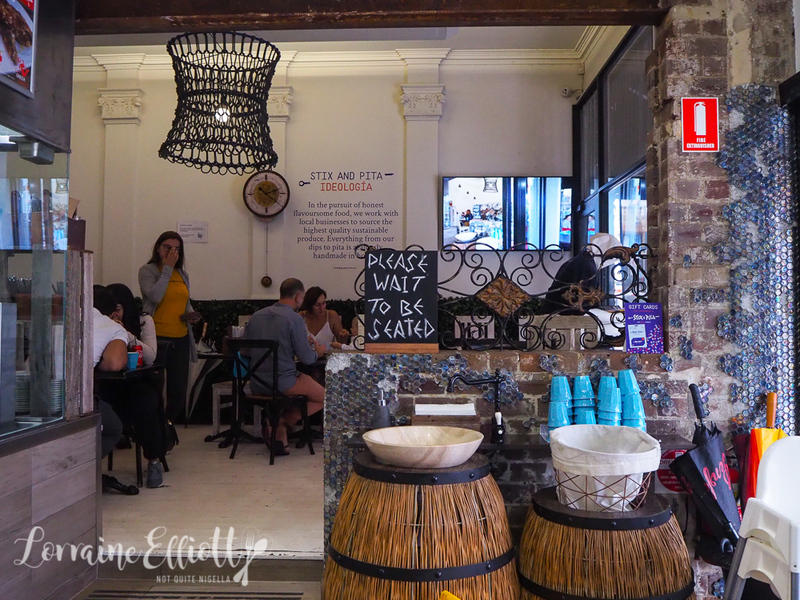 Service is lovely and friendly and I make an order at the counter and they bring the food to our table. 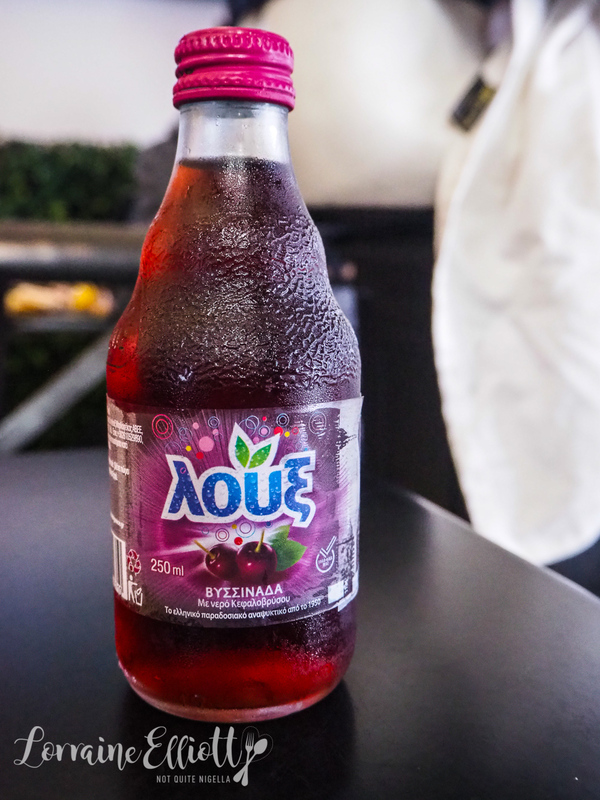 There are some Greek soft drinks - most have an equivalent in Australia except for the sour cherry soda which is delicious (I looove sour cherries!). Because I've stalked them online I know what I want straight away which is a good thing because it's almost 2pm and my stomach is rumbling having missed breakfast. I have to chuckle at the serve of chips that can be ordered as "some" (small) or "lots" (large). I would have ordered the dips too but these are $9.90 each and I wish they had a dip sampler plate or something like that as dips go so well with meat, pita and salad. 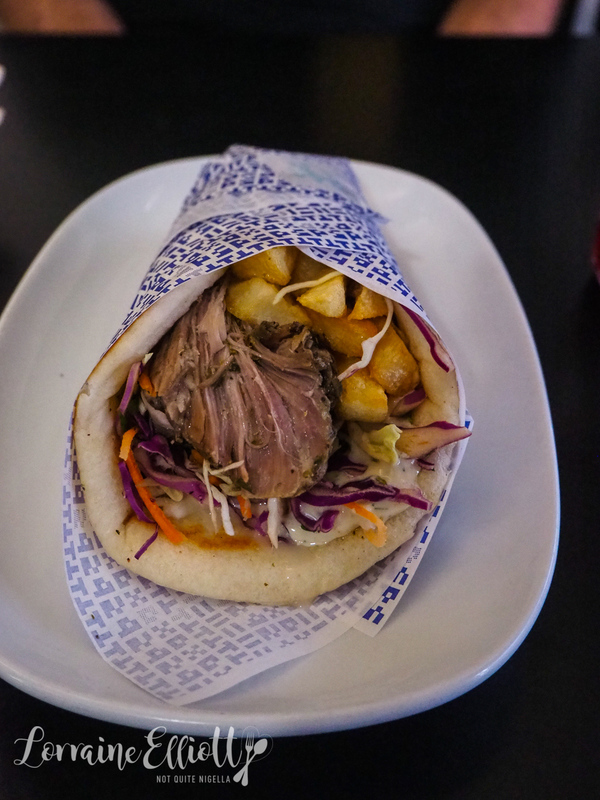 Lamb is of course a big draw and if you order two "naked meats" they come with tzatziki and pita bread with a wedge of lemon. I go for the chicken and lamb backstrap stix and holy heavens they are so juicy and tender. Mr NQN is similarly smitten and I like the accompaniment of soft, warm pita bread. 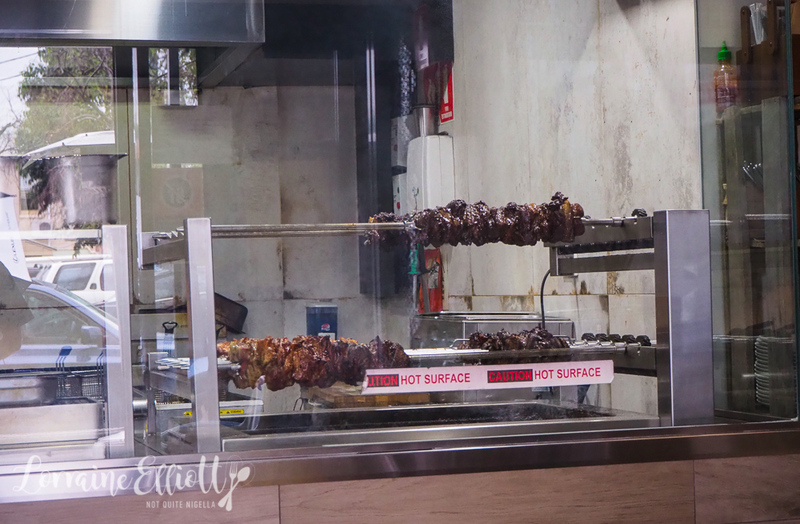 You can choose one souvla meat to go with your Achilles plate. I decided to go for the crispy pork belly although the lamb was a close second. The pork belly comes out as four thick pieces with a crunchy crackling and soft meat underneath. 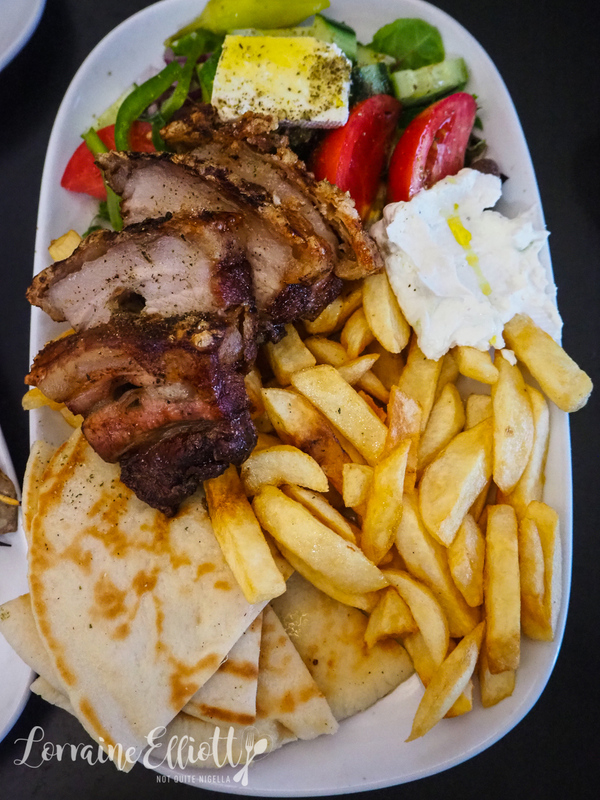 There's also a chunky Greek salad, a large serve of chips, tzatziki and four slices of warm pita bread. I had to go for the lamb gyro and there's a choice of lamb souvla or lamb kleftiko that has been slow cooked for 11 hours. I don't know about you Dear Reader, but if someone is prepared to cook something for a long time I usually order that because chances are I may not devote the time to do it myself. You can choose from a range of four fillings and they all sound good. When I ask the guy behind the counter. "Medusa!" he whispers conspiratorially. And so it is with the special mayo, Mediterranean slaw and chips. And both of us are in love with this gyro. The Mediterranean slaw gives the wrap juiciness while the chips are still crisp. My hands are covered in sauces, meat and bread so I use the sink nearby to wash my hands before letting them know that we are ready for the bougatsa. So tell me Dear Reader, do you go for long and slow cooked meats because you know you may not spend the time doing it? 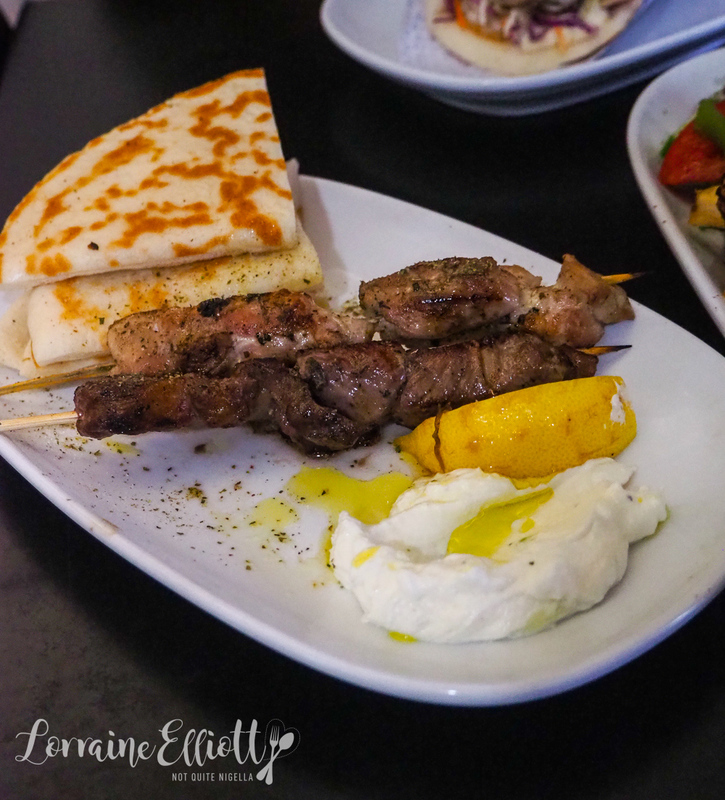 Do you always order lamb when you go out for Greek food?